Anti aging and the Health benefits of mangosteen go hand in hand. The “Exotic Mangosteen fruit” has been recognized for centuries for its incredible health benefits. Along with numerous health-enhancing properties it also provides anti aging benefits. This remarkable fruit consists of 3 major parts (pericarp, pulp and seeds) that contain some of the most active compounds that have antioxidant, anti-bacterial, and anti-fungal properties found in nature. 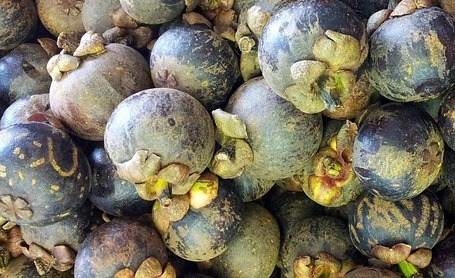 The mangosteen is a great source of xanthones. It has over 40 powerful antioxidants known as xanthone. Studies show that the highest level of xanthones is found in the bitter peel of the fruit which can be extracted and formulated into many nutritional products. Aside from the wonderful health benefits of mangosteen it also delivers skin and hair care benefits. Free radical damage is the number one cause of aging. This damage causes cell renewal to slow down and it deteriorates the structural support of the skin. The breakdown of the tissue and collagen protein will result in sagging and loss of firmness. A fruit source so rich in antioxidants can help protect us from the cellular damage that is caused by free radicals. Consuming antioxidant vitamins increases antioxidants in the body to help in the defense against free-radical damage. The beneficial xanthones found in mangosteen are proving to be significant substances for good health and anti aging skin care. They are important for men and women who attempt to turn the clock back. The antioxidant power of this nutrient is greater than that of Vitamins C and E.
Antioxidants attack and remove the free radicals from the body and help to control damaging effects that cause cell damage. This type of cellular damage has been linked to premature aging of the skin causing lines and wrinkle formations and a loss of collagen. Strong antioxidants and regenerative nutrients help make the complexion radiant, smoother, and softer. If you are looking for a more natural way of healing acne and acne prone skin, you may want to try mangosteen. The strong antioxidants in mangosteen have shown incredible healing properties. Due to the fruits natural anti-inflammatory and anti-bacterial properties it will help treat the inflammation and fight off infections. By taking antioxidants it will help guard against toxic build up in the body that can aggravate acne and clear away any accumulation of pore clogging bacteria. If you remove the cause of acne by cleansing your system of free radicals,and decrease the inflammation you can help protect yourself from future breakouts. Stress alone is an open invitation for free radicals to invade the body. High levels of stress damages our health and in turn –our skin’ health . When you are tense your body releases stress hormones. Often in the case of acne problems stress can trigger flareups by increasing oil production.